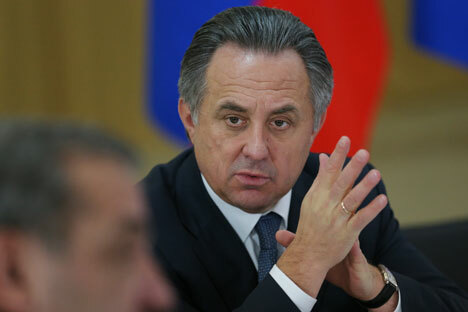 The executives of the International Federation of Football Associations (FIFA), arrested on corruption charges were not related to the 2018 World Cup bidding campaign, says Russian Sports Minister Vitaly Mutko. "If you take these people, many of them had no relation to the 2018 World Cup bidding campaign. They were not Executive Committee members and didn't take part [in the bidding campaign]," Mutko told Interfax on May 27. Mutko is currently a member of the FIFA Executive Committee. Nine senior officials of the FIFA have been arrested by Swiss police over corruption and bribery allegations, the Swiss Federal Office of Justice said on May 27. The officials were arrested at the request of the U.S. authorities and are facing extradition to the United States. U.S. authorities suspect the officials of having received bribes "totaling more than $100 million" and vote rigging in the selection of venues for World Cup tournaments, the justice office said. The officials arrived in Switzerland for a congress, where current FIFA president Sepp Blatter is expected to be elected for a fifth term. Read more: Will Russian football fans pay for conflict in Ukraine?